As a matter of course, each Apple Watch app will come with its corresponding application for iPhone. 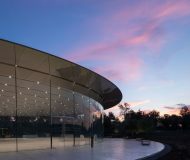 In view of that, first a quick disclaimer about the main benchmarks we are applying: the goodwill of the opinions below is largely predicated on the quality of the Apple Watch app, taking precedence over the capabilities of the iPhone apps. 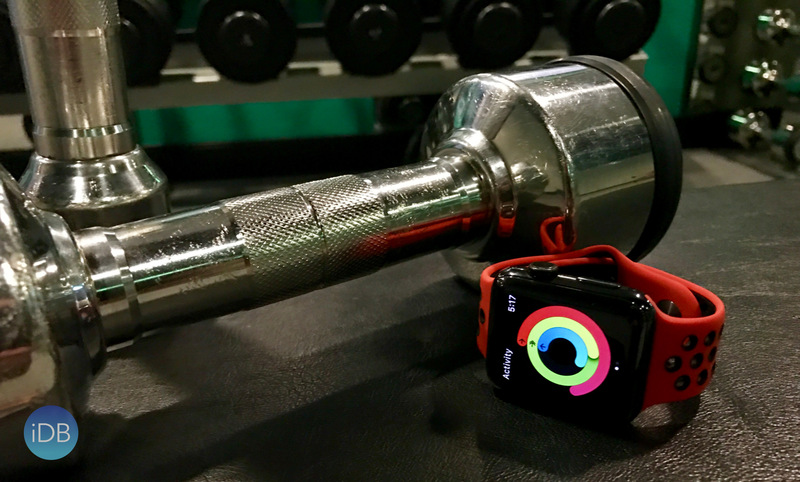 The goal of the comparison is to crown the best gym companion on your wrist, meaning the greater the degree of independence, the more likely is a favorable bottom line. 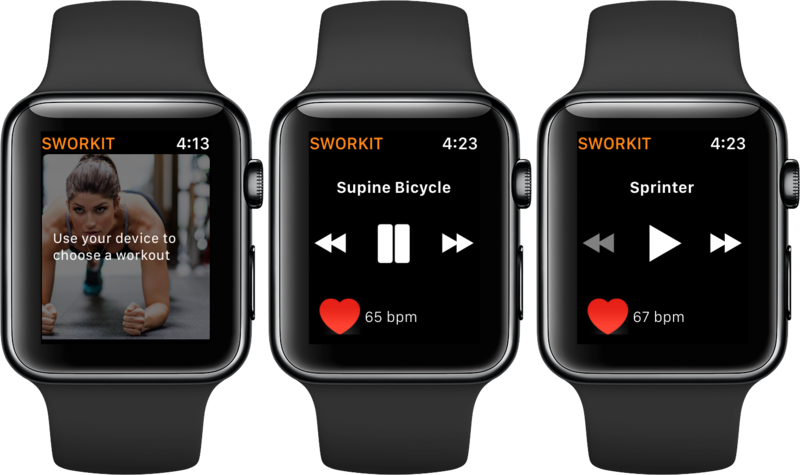 The basic outfit of Sworkit on iPhone is serviceable and comes with a good amount of workout plans, programs and an exemplary collection of training routines. It’s a pretty good inspiration if you are after new moves in the gym or at home to tone a certain area of your body. Sworkit plugs a premium subscription pegged at $4.99 and promises more customised workouts, exercises and a web app for the big screen. Unfortunately for Sworkit, the real yardstick for this test is the prowess on Apple Watch, which is where the app vastly underperforms. Installed, the app does not function as a standalone program but merely mirrors the workouts initiated on iPhone. In other words, you will always need both devices nearby to train. To add insult to injury, the watch interface does not make good use of the small info screen on your wrist. The only argument in favor of the wrist version of Sworkit is the embedded heart rate monitor and integration into Apple’s Health kit. Alas, this is not good enough if you’re looking for a PT on your wrist. Download Sworkit from the App Store. Purely by looking at the pricing structure (total lack of subscription service) you could infer that this app for both iPhone and Apple Watch would be less packed with features… and you would be absolutely correct. On iPhone, 7 Minutes by Wahoo does provide 12 single exercises, which cannot be shuffled or repeated as multiple sets until a one-time fee of $1.99 is discharged. The dozen exercises are guaranteed to get your heart pumping, but beyond that there is no guidance, explanations or motivational factors at play. 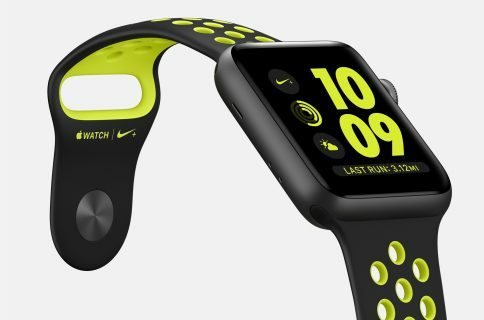 Regrettably, and you will start to detect a pattern with some of these fitness apps, the watch app again needs to be tethered to an iPhone in order to display workout information. Making matters worse, the information is simply pushed from your iPhone (running the workout) to your wrist. This is mirroring in its most idle form, so idle in fact that the workout app is not able of putting two and two together and at least displaying the wearer’s heartbeat. What should be the low-hanging fruit today on Apple Watch, 7 Minutes by Wahoo flunked. Download 7 Minutes by Wahoo from the App Store. 8Fit decorates itself with accolades won in 2016 (Best of 2016 in App Store) and by and large walks the talk. The concept of a personal trainer is extended past fitness training and also devises eating plans and nutritional information. 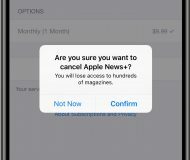 The latter half of it is mostly locked away behind the subscription curtain, as is unfettered access to the sport programs. If you want to freeload, 8Fit can offer you 3 complete workout programs (light, intermediate, expert), which are an interesting cocktail of cardio and strength exercises. The by far most salient feature of 8Fit is that the Apple Watch app is self-sufficient and does not hinge on its big iPhone brother to execute the job. After running through the set-up, you will be able to download the workout programs right from your watch (whenever connected to Wi-Fi or your phone) and hit the gym sans iPhone. 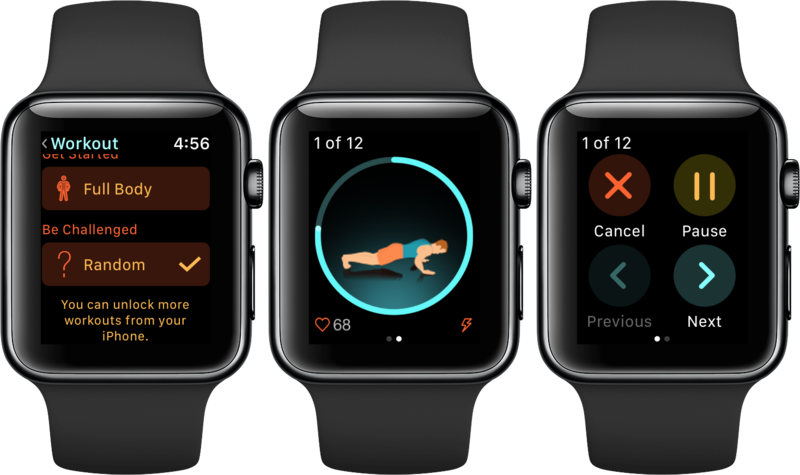 What’s more, the application’s interface does actually make sense on your wrist and boasts all the visuals (including videos) and switches you need for a successful session. Health integration works neatly and if you’re obsessed with filling your activity rings, workouts will count towards that as well. Kudos. Download 8Fit from the App Store. 7MWC has recently added watch support and thankfully did not take any shortcuts with it. The iPhone app is going to cost you $2.99 upfront in exchange for a pretty lean in app experience. 7MWC does not punch above its weight and tries to keep the focus on physical exercise, no distractions needed. 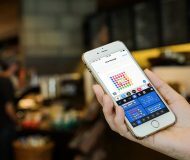 Curiously, the app attempts a balancing act between cashing in more revenue by way of in-app purchases and giving those bonus workouts away for free, if certain workout achievements are met. The classic workout set contains 12 exercises – run the cycle often and frequent enough to attain the bonus packages. 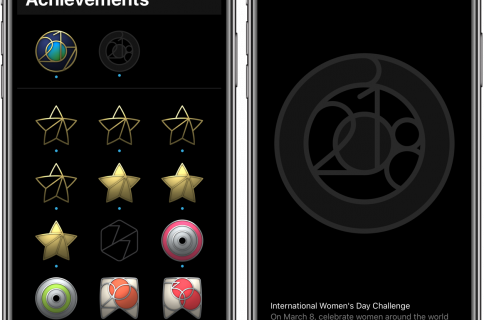 As far as the watch app is concerned, 7MWC is a clean, standalone application that is ready to go right out of the gate. You simply click the workout you want to embark on and off you go: the watch will count you down and you’ll be in a sweat before you know it. 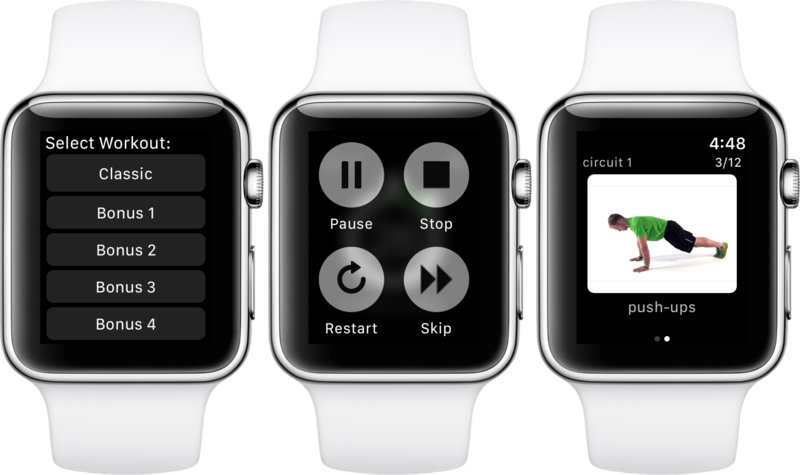 Force touch is enabled to skip or rewind exercises, a simple swipe gives you a demo of the movements. Unless stashed away obscurely, it does not tap into Healthkit. While a downside, it is more or less cancelled out by the fact you can grab your watch and kick off the session so easily. Download 7 Minute Workout Challenge from the App Store. As a nod to all the readers staying with us till the end, you will now be rewarded with what I consider to be the most competent and functional app available on the App Store as we speak. Seven looks beautiful on both your iPhone and Apple Watch, the apps are workable completely independently of one another and the initial download is free. This way, you will get a good grasp of how Seven sets out to service and beef up your bodily constitution (plans, workouts for specific muscle groups, challenges, tracking) before you can either purchase individual workouts or sign up for a club membership. If you are serious about shedding weight or strengthening your muscles, $4.99 per month definitely means more value than incremental purchases. 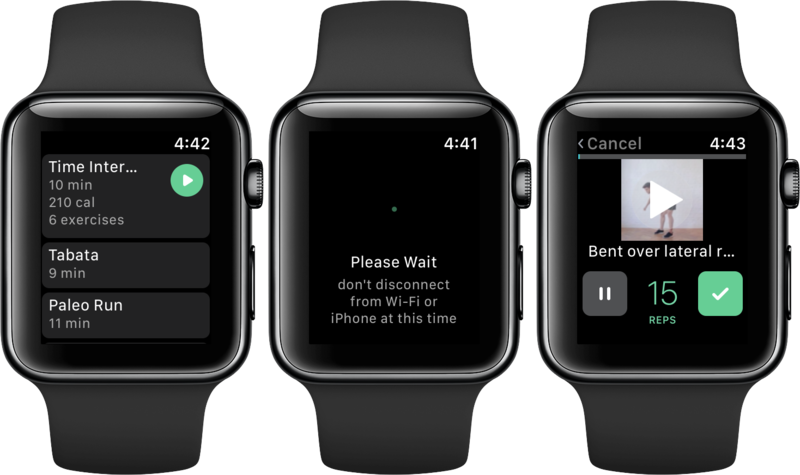 On watch, the app design looks and feels refined and too works right after installation. A full body workout is at your disposal from the getgo, the animations are smooth, navigation is intuitive and even your heart rate is monitored, all in one screen – Hallelujah! 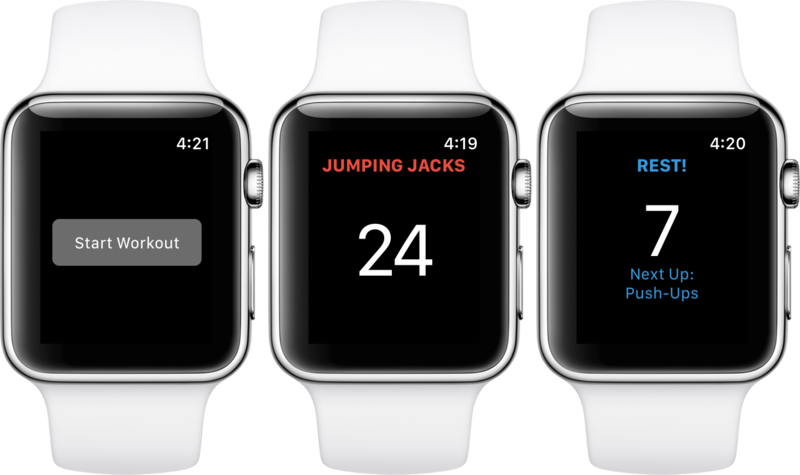 Once unlocked on your iPhone, new workouts will appear on watch, which thereafter can be downloaded for offline training. Seven gets most things right and leaves me with very little to gripe about. 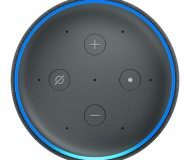 Considering it even allows for a ‘drill sergeant’ voice option to egg me on from the watch’s speaker, this is the closest thing to a personal trainer I have come across thus far. So next time you head to the gym, why not give this one a spin? Download Seven from the App Store. Have questions or further recommendations regarding fitness apps on Apple Watch?